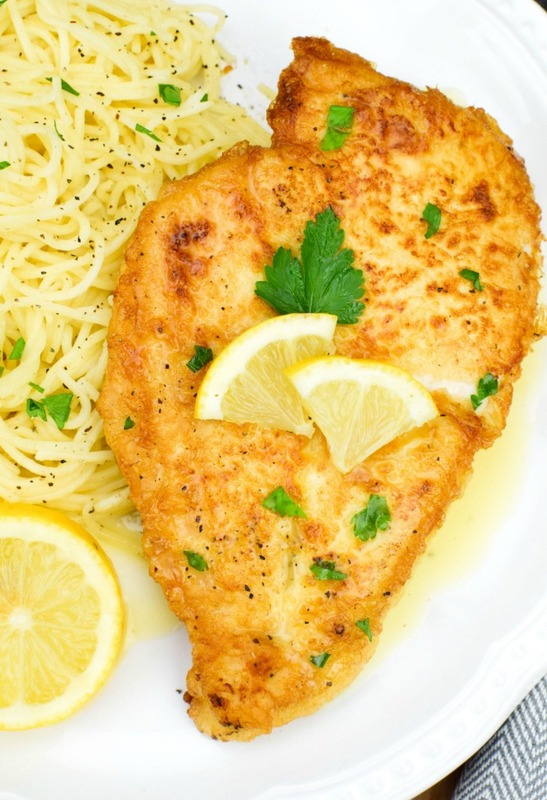 Chicken Francaise- A Delicious,One Skillet, Italian Chicken Dish! Chicken Francaise is an impressive dish that celebrates our American “Melting Pot” by bringing together two of my favorite cuisines – Italian and French. The bonus is its feasibility for a busy weeknight treat, allowing you to put together a complex and delicious dish with simple ingredients and limited time. If you’ve watched foodie films – “Like Water for Chocolate,” “Eat Drink Man Woman,” or even “Eat Pray Love” – and, well, you like food, you’ve been hypnotized by beautifully set tables and artfully prepared dishes, drizzled with velvety sauces and swooned over by hungry humans. This appreciation exists both on and off the screen, whether there’s relevant dialogue, a soft violin in the background, or subtitles and a foreign language. While poets have proclaimed love the universal language, I believe food rightly shares that title, as evidenced by the amazing offerings from so many different cultures, and occasional fusions of those cuisines that hit it out of the park. The recipe I’m offering today, Chicken Francaise, is a perfect example of the mingling of two distinctive European tastes that will transform your dining table into a magical bridge over any communication barrier – this dish does all the talking! If you happen to research Chicken Francaise recipes, you’ll find different names for this French-inspired dish. According to my recherche Google [spoken in my very best French accent], this dish was created sometime around the mid-1900s after worlds-fair goers were wowed by the simple, light dishes of traditional French cuisine. The Chicken Francaise wiki (yep, there’s a wiki for that), suggests the Italians likely used veal to prepare that original Francaise, but over time (and particularly in the U.S.) chicken became a preferred substitute that was more cost-effective (and conscience-comforting). Whether it’s actually a little more French or a little more Italian, it’s a whole lot of awesome! Knowing the dish’s Italian heritage, I started my quest for the perfect recipe by searching for which Chicken Francaise recipe Giada recommends. Ms. De Laurentiis is, after all, a go-to source for all things Italian. Unfortunately, her published repertoire at this point is lacking in the Francaise department. The Food Network did turn up a Chicken Francese Rachael Ray featured on her television show, but the instructions include adding Parmesan cheese to the egg wash, which I’m sure is a welcomed addition (helloooo, it’s cheese), but I wanted my overall dish to retain the slightly lighter feel of the original. Other internet offerings, like the Chicken Francaise Recipe30, has posted, bump up the cheese factor even more. Since I really wanted the lemon and butter to shine here, I ultimately fell in love with a more traditional version of the Chicken Francaise recipe on Epicurious.com. Their recipe produces perfectly crispy chicken, blanketed in decadent sauce with the perfect amount of lemon, balanced with a generous knob of butter – all of the flavors of the original recipe that would, I’m sure, be Giada-approved. Delizioso! 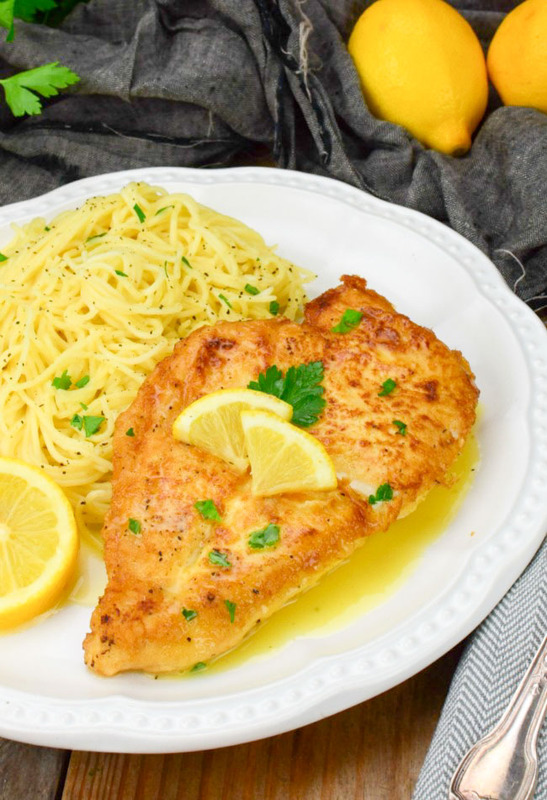 If you’re wondering what to serve with Chicken Francaise, my advice is to prepare some al-dente pasta (angel hair is my favorite) to capture a little more of the rich, buttery sauce. I absolutely adore this simple sauce so, my recipe below reflects double the sauce ingredients from the original. Add a side of sautéed spinach or Swiss chard for a complete meal. Aside from the happy dance, your foodie brain will be doing over that absolute deliciousness of this recipe, the added benefit of this dish is that the whole thing comes together fairly quickly. You can make this impressive meal on a weeknight as a special treat for a special occasion, wowing your family with minimum effort. Don’t worry, though, that secret is safe with me, friend! In a shallow bowl, mix together flour, 1 teaspoon salt, and 1/2 pepper. Set aside. Beat the eggs in a second shallow bowl. Set aside. Dry the chicken of any moisture with paper towels. Heat the oil in a 12 inch, high sided skillet, over medium heat. While the oil is heating, dredge 2 chicken breasts in flour mixture, shaking off excess. When oil begins to shimmers, dip the 2 floured breasts in egg mixture and coat both sides, allowing excess to drip off, then add to the skillet. Repeat with 2 remaining breasts. Cook breasts, until golden brown, flipping over once (coating is delicate) until the chicken is cooked through, approximately 4-6 minutes. Remove cooked chicken to a paper towel-lined plate and tent loosely with aluminum foil to keep warm. Pour out and throw away oil from the skillet. Wipe the skillet out with paper towels. Add the butter to the skillet and heat over medium-low, until butter is melted and foam subsides. Chicken: Have you ever taken the time to painstakingly pound your chicken breasts to tender, thin perfection only to realize that the piece(s) are now too huge to fit more than one or two comfortably in a pan? What’s the rest of my dinner party eating? My time and sanity-saving suggestion here is to buy chicken cutlets at the grocery store. Sometimes labeled “chicken scallopine,” this market-ready thin cut chicken is a great time saver and makes the dish sooooo much easier to prepare. If you’re a little paranoid about cross contamination in the kitchen (which we really all SHOULD be), buying the chicken ready-for-breading also prevents the need for endless scrubbing and bleaching and salmonella-ridding activities that add up to even more time in the kitchen. Moral of the story—buy the chicken thin cut! Wine: I make this with a dry chardonnay. I like how a dry white wine complements the lemon flavor in the sauce and really don’t care for it when a sweeter variety is used. Remember the wine you use will impact the flavor of the sauce a great deal, so it’s best to follow the rule of only using something to cook with that’s good enough to have a glass of yourself. 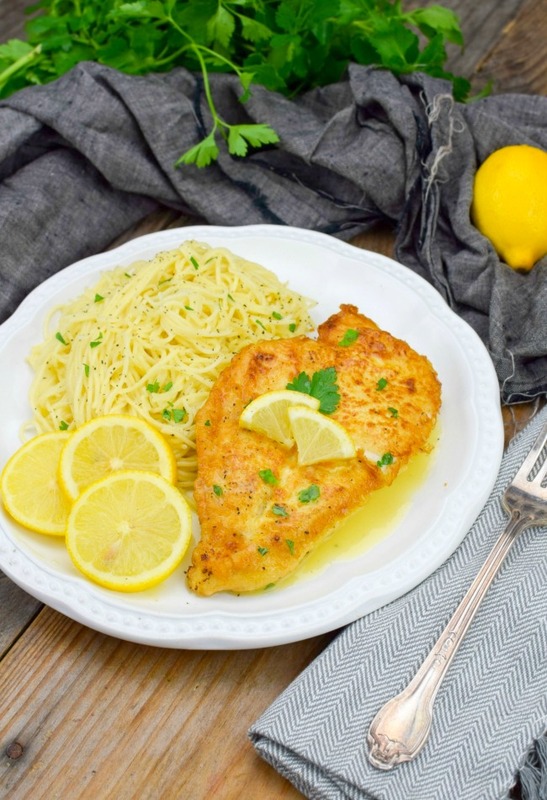 Lemon Juice: Any Chicken Francaise description will include references to the bright, tangy, acidity from the lemon which really is a star in this dish. To preserve that quality, this recipe MUST be made with fresh lemon juice from a fresh lemon. PLEASE don’t even think about using that juice from the yellow plastic imposter! Pan Sauce: This is one of the only times I will ever suggest you wipe out the pan first or cook the sauce in a separate pan. Generally, I love to incorporate those little brown bits created in the bottom of the pan, called fond, when the chicken pieces are browned. But this sauce, in particular, is a white sauce, and removing the fond will make sure the sauce stays the correct color. After all, we’re trying to serve a professional-quality dish, here, and the result will be a sauce that rivals any Italian-American restaurant. By not wiping out the pan you will definitely have a more flavorful, if slightly less authentic, sauce, though, so feel free to make it either way. Low Fat: Let me be perfectly honest. Forget about counting calories and fat grams in this dish. 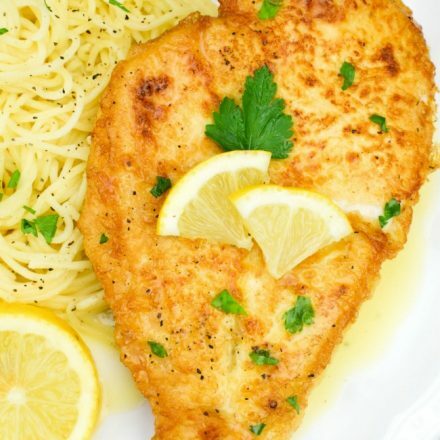 The recipe doesn’t work if you cut back since those ingredients, especially a quality butter, are integral to the right preparation, flavor, and texture of Chicken Francaise. Go ahead and cut back on them if you absolutely must, but there’s just no way to achieve a restaurant-quality dish if you do. Chicken Francaise calories are calories well spent! Brown Sugar Crock Pot Chicken– One of those crock pot recipes that are super delicious, family-friendly, and super easy to make! Parmesan Crusted Chicken– One of the most delicious, quick and easy chicken recipes EVER! French Onion Chicken– Our French Onion Chicken skillet is cheesy, packed with flavor and it’s a cinch to make. Leftovers (if any) have a very short lifespan. I cannot for the life of me figure out how to print this recipe for Chicken Francaise . When I click “print recipe” at the top of the page all I get is the Recipe Notes – no actual recipe. Hey Robin, so sorry, I have a glitch on the blog. It should be fixed within the hour! Where is the Recipe for the chicken francese? Hi Nancy, so sorry, I have a glitch on the blog. It should be fixed within the hour!